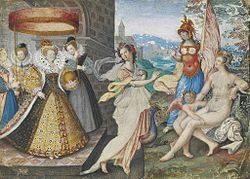 Elizabeth I and the three Goddesses Juno, Minerva & Venus. In religious terms, divinity or godhead is the state of things that come from a supernatural power or deity, such as a god, supreme being, Creator-God or spirits, and are therefore regarded as sacred and holy.<ref name="wiktionary">Wiktionary: "divine (comparative more divine, superlative most divine) 1) of or pertaining to a god 2) eternal, holy, or otherwise supernatural 3) of superhuman or surpassing excellence 4) beautiful, heavenly</ref><ref name="dictionary.com">divine - Dictionary.com.</ref><ref>divine - Merriam Webster.</ref> Such things are regarded as "divine" due to their transcendental origins, and/or because their attributes or qualities are superior or supreme relative to things of the Earth.<ref name=wiktionary/> Divine things are regarded as eternal and based in truth,<ref name=wiktionary/> while material things are regarded as ephemeral and based in illusion. Such things that may qualify as "divine" are apparitions, visions, prophecies, miracles, and in some views also the soul, or more general things like resurrection, immortality, grace, and salvation. Otherwise what is or is not divine may be loosely defined, as it is used by different belief systems. The root of the word "divine" is literally "godly" (from the Latin deus, cf. Dyaus, closely related to Greek zeus, div in Persian and deva in Sanskrit), but the use varies significantly depending on which deity is being discussed. This article outlines the major distinctions in the conventional use of the terms. For specific related academic terms, see Divinity (academic discipline), or Divine (Anglican).